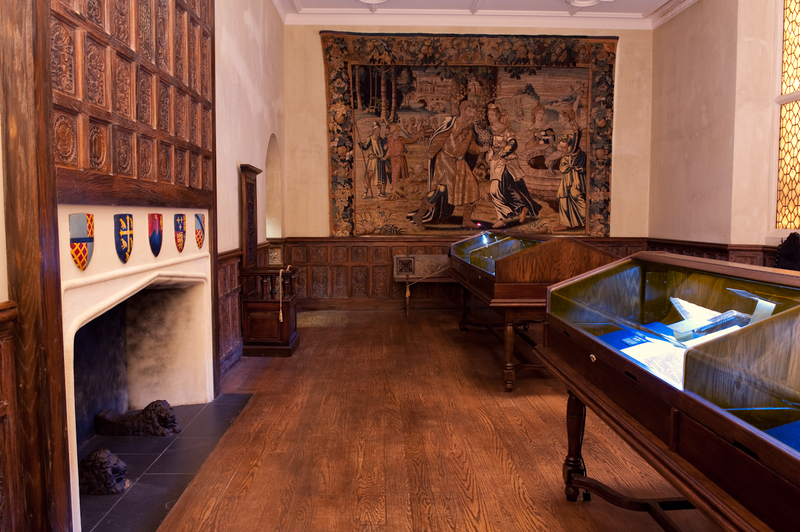 The Jerusalem Chamber is reproduced in the Mack Library with the kind permission of the Dean and the Chapter of Westminster Abbey and serves as the display area for the University's collection of rare Bibles. Dean Stanley (1864-81) removed the lowered ceiling and repaneled the walls with cedar wood brought from Lebanon. He did not, however, remove the carved cedarwood overmantel. 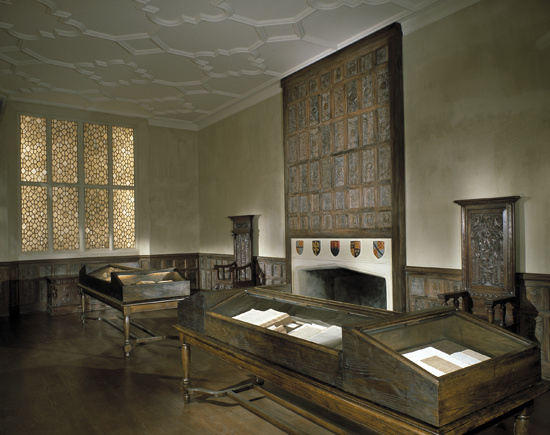 It had been installed by Lord Keeper Williams, Dean of Westminster in the reign of James I, when the room was remodeled to celebrate the betrothal of Charles I, then Prince of Wales, and the French Princess Henrietta Maria (1624). On a visit to the Abbey on the eve of his departure, "while he was making his prayers at St. Edward's Shrine to take there his leave and so speed him on his journey, he became so sick that such as were about him feared that he would have died right there. Wherefore they, for his comfort, bore him into the Abbot's place and laid him down before the fire in his chamber. On coming to himself and learning that he was in the Chamber named Hierusalem, then said the King, 'Laud be to the Father of Heaven! for now I know that I shall die in this chamber, according to the prophecy made of me beforesaid, that I should die in Hierusalem,' and so he made himself ready, and died shortly after." The Jerusalem Chamber was used in 1611 by the translators of the King James Version and by the committees on the Revised Standard Version of 1885 and the New English Bible (New Testament) of 1961. The Upper House of Convocation (Bishops) has frequently met there, and many famous persons have lain in state there. The Chamber has been in constant use for about 600 years. It is, in effect, the official reception room for the Dean of Westminster and therefore is not open to tourists. Dixie Baptist Church, Clarkston, Michigan, under the leadership of Dr. Paul Vanaman, pastor, provided the funds for the interior design of this reproduction of the Jerusalem Chamber. Harrell Whittington, a member of the University staff, and Dr. Jones designed the Tudor ceiling and wall paneling based on their probable appearance in 1611. Mr. Whittington worked out to an exact scale the drawing for the room. Melvin Stratton and John Swaffer, also members of the staff, were responsible for the construction. Bible. English. Authorized. 1611 Translation directed by Lancelot Andrewes and John Harding; edited by Miles Smith and Thomas Bilson. Title within engraved architectural border signed C. Boel fecit. Second state of the first edition of the King James Bible, sometimes called the "she" Bible because of the reading of Ruth III, 15: "she went into the citie." Signatures: [superscript pi]A-B⁴ C⁶ D⁴, ²[superscript pi]A-C⁶ chi² A-5C⁶, ²A-2A⁶. Separate title pages for: "The genealogies recorded in the sacred Scriptures ... by J.S." and "The Newe Testament of our Lord and sauiour Iesus Christ." Calendar, almanac, & The name and order of all the books in red and black. Two columns per page in black letter within rules.